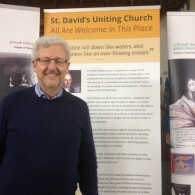 The Radio 4 Sunday Worship programme was broadcast from St. David’s Uniting Church this morning. Click here to listen to the programme. During the service, a hymn written by Beverley Humphries was sung. Click here to see the words of the hymn.